This page tells the story of FreeBike Project! 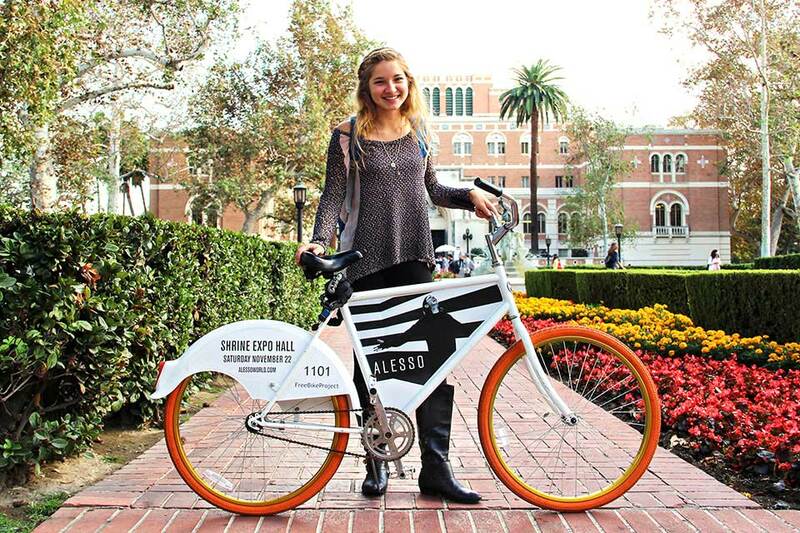 "Solve the student need for transportation through company-sponsored bikes while making a positive impact on the world." With that mission statement we knew we had a few tasks ahead of us. Fortunately, we do love a challenge. After refining the concept, testing several prototypes, and securing early commitments from local businesses, we ordered our first batch of custom-made bikes and kept our fingers crossed. After three months of communicating with the factory and getting ready to launch, the container finally arrived and we knew from that moment on that things were about to get interesting. We launched in the spring of 2013 at the University of Southern California. The reception was fantastic and in less than three days, the first 100 bikes had been leased out to students free of charge (except for a $99 security deposit). Following in the footsteps of most entrepreneurs before us, we learned through trial and error until our first school ran smoothly. At the end of the semester we collected the bikes, returned the deposits and hosted a big party for all of the riders. In addition, we made our first donation of bikes to the Philippines in partnership with Bikes for the World (see the Impact section). In the fall of 2013 we went from operating on one school to multiple schools located throughout the country. Having just ordered a new batch of bikes, we signed a contract with a client who requested a nationwide campaign. Dealing with more logistics, different school policies, and a much larger number of students was exciting but also very challenging. With the help of campus managers and countless nights burning the midnight oil, we managed to successfully launch on 12 new schools within the first month of the new year. Now operating on a national scale, we added more structure to the company. We clearly divided roles and responsibilities, we changed from an LLC to a corporation, and we invested in new equipment which significantly reduced the cost of vinyls and production time. From our riders' and clients' perspective we added more structure as well. We included a custom lock with each bike and offered free maintenance on all schools to set a higher standard for safety and reliability. We created monthly reports and videos for clients with interviews, photo collages and metrics. In the spring of 2014 we received funding from Tim Draper, which would enable us to design better bikes, build a new website with improved data tracking, and expand to even more schools. We moved our office from LA, California, to Phoenix, Arizona, due to the large schools and growing startup community in the area. We once again wrapped up the year by re-collecting the bikes and storing them over the summer, only this time using several storage units to accommodate the vast number of bikes in different cities. Following the success of last year's expansion, we took major steps toward creating a better experience of students and clients. A big improvement was our 3rd generation bikes featuring a new frame, allowing for people of various heights to ride more comfortably. We implemented a more advanced database to collect helpful information from students and a client section where companies could log in and view the effect of their campaigns in real time. future, as well as the future plans of its founding team members. We decided that it was time to pass the baton to a larger company with the resources to take our initial concept to the next level. We distributed our bikes to several entities, based on their alignment with our original mission. The majority of the bikes were either transferred to Draper University, a boarding school teaching entrepreneurship, or sold to Alt Terrain, an advertising agency with some innovative ideas of how to use the bikes in cities. The remaining bikes were sold to incubators, including Los Angeles Cleantech Incubator, and donated to local nonprofits. Despite the decision to move on, looking back over the last three years, we have very few regrets. We are truly grateful for having had the opportunity to make a difference in the world and work with so many wonderful people. From partners and mentors who lent us their insights to managers and riders who helped spin the wheels. We knew it wasn't going to be easy, but if your dreams don't push you over a few edges you aren't dreaming big enough. We promise that the experience and lessons will be put to solid use in the future as we move on to new ventures. Thank you all for supporting us, and best of luck in the future!